Gender Diversity: How Is it Seen in Romanian Business? 6th Edition: CEOs and organizational culture: what makes it or breaks it? The Vienna Test System HR is the version of the Vienna Test System (VTS) that is specially adapted for suitability assessment. It is used for recruitment, staff development and career guidance – both for office workers and for staff in jobs in which safety is important. The Vienna Test System HR is designed on a modular basis: a wide range of psychological tests (personality tests, intelligence tests, ability tests, interest tests, etc.) are available, enabling the user to select those that are most appropriate to the requirements profile. Ten test administrations of the 28 psychological tests most frequently used by HR managers (including BFSI Big Five Structure Inventory, INSBAT Intelligence Structure Battery, 2HAND Two-Hand Coordination) are included in the purchase of the Vienna Test System HR, as are five test administrations of each of the five test sets. The tests are easy to prepare, administration is standardized and fair and scoring is objective and efficient. The Vienna Test System HR meets all data protection criteria and meets the requirements of DIN 33430 and ÖNORM D4000. safety assessments for occupations with a high hazard or accident risk – especially professional drivers and rail and aviation personnel but also police, military, mineworkers etc. group testing, e.g. apprentice assessments or pre-course testing for students. When combined with a structured interview the tests of the Vienna Test System HRprovide sound and reliable information about the degree of similarity between the job profile and candidates’ profiles. The structured, standardized and objective process ensures that the same conditions apply to all applicants, so that all candidates have the same chance. You can use the Vienna Test System HR as a staff development tool. Whether the task is analysis of potential and training requirements, talent assessment or recruitment of future managers, psychological tests can be used to identify the skills and competences of staff. Compare target and actual levels as a basis for putting training measures in place and equipping staff to meet your company’s present and future needs. Reveal potential and recruit managers from your own workforce. Use psychological tests to discover where your staff shine and in what areas they need training, support, supervision or coaching. Training and career counselors use the Vienna Test System HR as a tool in educational, occupational and career counseling. In particular, when it comes to choosing a career, attitude and interest tests provide guidance and are an important aid to decision-making. Tests of special ability areas such as multitasking, technical comprehension or spatial visualization are used to compare an individual’s skills with a job description. In addition, there are general ability tests, personality tests and intelligence tests that help to identify particular talents. Many accidents are the result of human error. Mistakes can be made in both difficult and monotonous tasks. In all cases the effects on other people can be potentially disastrous. In some occupations it is therefore essential to adopt a safety-oriented approach, comply with safety requirements and take appropriate action in response to health and safety risks. 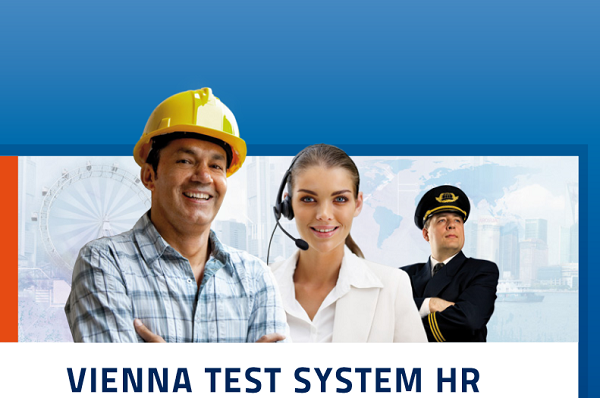 The Vienna Test System HR provides a wide range of special ability tests and test sets for the recruitment and appraisal of specialist workers in these fields. Use them to test professional drivers, air traffic control staff, train drivers, captains, mine workers, police officers, military personnel and many more. Use the Vienna Test System HR as an efficient, standardized and automated means of making a selection from a large pool of applicants – for example, of people applying for places on training courses or apprenticeship schemes. In a two-stage process you can first make a pre-selection and then use additional aptitude assessment tools to grade and select the top candidates. Group testing of this sort can be carried out either online or in a network. While other assessment tools such as interviews, assessment centers or CV analysis yield information about candidates’ behavioral repertoire either now or in the past, psychological tests focus on people’s longer-lasting and more fundamental characteristics. The information obtained from psychological tests can be used not only to explain present behavior but also to uncover potential that may not yet have been realized. Potential assessment thus not only helps to distinguish between candidates who are currently suitable or unsuitable but also identifies candidates who are likely to develop quickly in the direction of the requirements profile. For more details about cognitive ability tests and available reports or any other solution for your type of industry and personnel, contact us here. The certification experience was very interesting and practical. I have already used Hogan Assessment in large projects in the company, and the profiling and feedback received profiles are well appreciated by colleagues, managers or non-managers. I await the meetings within the alumni club with great pleasure! Care to socialize with Hart?